If you're in the NYC area, please come visit us at the Brooklyn Flea on Saturday the 12th. We'll be selling cheery valentine cards, tags, stationery sets... Our friends at Bonbon Oiseau will be selling lockets and other lovely jewelry. 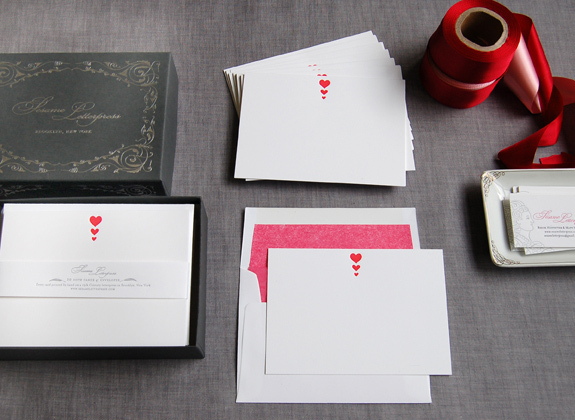 We've collaborated on some special gift-boxes, each with a pair of Bonbon vintage charm earrings, a Sesame letterpress card and a bag of Papabubble Valentine candies, for $45. The Gift-box profits will go to the American Heart Association. If you're feeling darker, we'll also have some skull items. Please stop by to say hello.